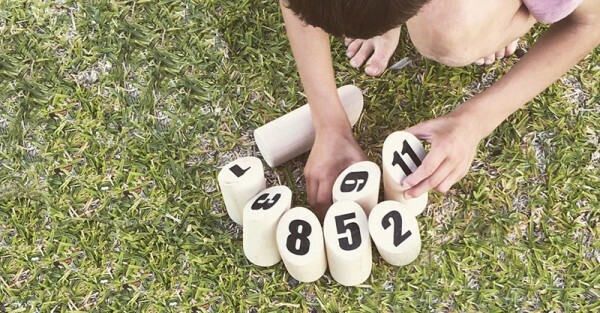 Have you discovered the fun, log tossing, math skill building Finnish game of Finska yet? It’s the perfect activity for summer nights and getting the whole family into the backyard for some friendly (read slightly competitive) fun! Who knew you could have so much fun with a lump of wood? I recently bought a Finska set, and can confidently say it’s the most long-standing fun we’ve had in our backyard for ages. Anyone can play – all you need to be able to do is throw a small wood log at a group of wooden pins and count – it’s really that easy. Our youngest lad loves to play Finska because he loves numbers and my husband loves it because he loves strategy and winning. Which makes it all the more hilarious for myself and the kids when he doesn’t. Made from durable birch, these pins withstand being knocked around during play – and boy, do they get knocked around! Each Finska set includes 12 numbered pins, a Finska throwing pin, laminated easy to understand rules and a reusable score card – all held together in a handy birch carry crate. Buy your very own Finska set direct from Finska from $69.90 a set, with free postage Australia wide.